What hurdles do health care practitioners face today as they’re launching their practices? Should they venture out into the potential rewards of a sole practice or seek out security with an established group? What about social media – should they tweet about their expertise? Are they living on peanut butter and jelly sandwiches while they pay off their college loans? How competitive is it to begin a practice as a dentist or doctor these days in Greater Des Moines? Here’s a look at some of the challenges that three of Central Iowa’s newest practitioners have, from the perspective of a doctor, dentist and chiropractor, each of whom is starting his or her own practice. For 28-year-old Dr. Chris LoRang, establishing a new chiropractic practice in Des Moines means building a lot of connections, and that includes using social media. “People will book appointments with me on Facebook,” said LoRang, who opened Capital Chiropractic and Rehabilitation Center in the East Village in July 2013. 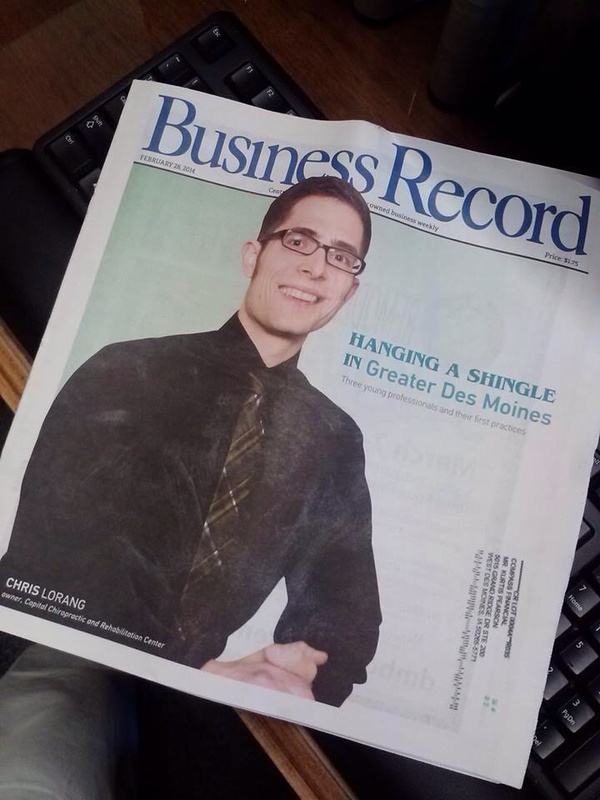 LoRang – whose practice was recently named 2013 Business of the Year by the Des Moines Downtown Chamber – has also gotten his name out into the community by providing free chiropractic services at events such as the IMT Des Moines Marathon and the Hy-Vee Road Race during the Drake Relays. “With those events, part of it is literally just providing a service to athletes in the community,” he said. Building a clientele is a challenge, but it’s not the most difficult part of starting a practice, LoRang said. The most difficult task? Getting credentialed with the major insurance companies and mastering their complex claims systems. Historically, chiropractors have tended to operate independently as solo practices, but that trend has been shifting toward more group practices to share overhead costs, LoRang noted. “I looked at several opportunities (with chiropractic clinics) within Greater Des Moines, but nothing fit my treatment approach at the time I was looking,” he said. As part of the curriculum at the Palmer College of Chiropractic in Davenport, LoRang was required to write a business plan for his practice. “Even the people who plan to go into practice with someone else still have that project,” he said. As he researched for his business plan, LoRang compiled best practices from the business plans of chiropractors, and then got a reality check by working with an adviser at the Small Business Development Center. He also got a primer on financial spreadsheets from a program provided by NCMIC Group Inc., a Clive-based malpractice insurance provider. A mentor has been Dr. Braxton Pulley, a chiropractor who practices a few blocks away in the East Village. Now that he’s several months into his practice, LoRang is looking ahead to the day when he’ll hire his first employee – a part-time receptionist. “That time, thankfully, is approaching faster than I expected,” he said. Overall, just being open is a relief after years of preparation and anticipation. See the full article on the Business Record website.